Google seems to be caught in two minds as far as the New Tab page on Chrome is concerned. The search giant has just released Chrome Dev 59, and once again the New Tab page has been tweaked. This is the third time Google has altered the page, with first big changes coming in version 54, followed by version 56. Following are the few screenshots of the new Chrome Dev 59, alongside the Chrome 57 variant. 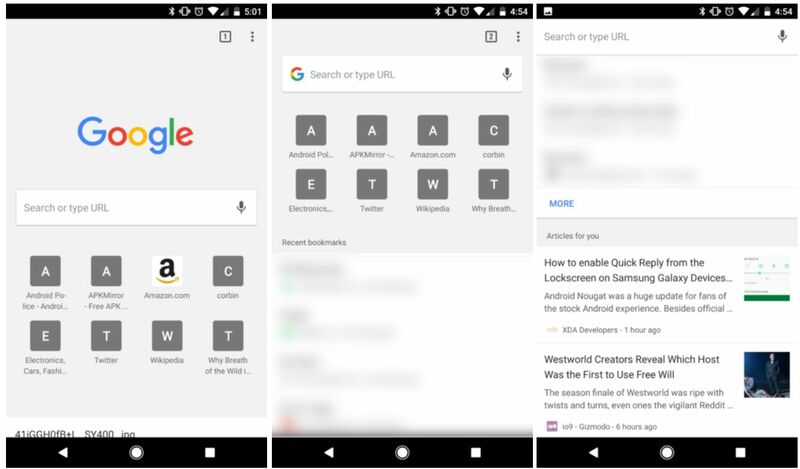 As you can notice in the images, Google has removed its big logo in favor of a small icon in the search bar. It seems more refined, with good usage of space. Recommendations and recent downloads/bookmarks are much more accessible with the new design. In case, you can’t notice these tweaks, enable the #ntp-google-g-in-omnibox flag. Other than the New Tab Page, Google is also making changes to the Chrome Home. However, there is no guarantee of search giant shipping them in the final release of Chrome 59. The latest update is now available in the Google Play Store and might hit your device in coming days. In case, you can’t wait for the official OTA release, follow the means described to download the APK manually. Google Chrome Dev 59 is 69.08 MB in size and mean for developers to get an idea what’s in store for the next big update. The latest update works on all android smartphones running Android 5.0 and above. You can download the latest APK from UptoDown.com. Alternatively, you can visit other trusted mirror websites like APKMirror for the same. For those who don’t know, Chrome is a Google internet browser available on the PC and mobile devices. And Chrome Dev is a different branch of the same. All new features and tweaks are first made available on this variant, before being shipped in the stable branch. Next articleRick And Morty Season 3 Release Date And Updates: First Episode Going To Air On April 24?